Nordic walking is suitable for all age groups and abilities of people who can walk, including those with some mobility limitations, offering significant health benefits. You may discover that Nordic walking enables you to move more easily and, therefore, to exercise at a higher intensity than you can not only when natural walking, but also when doing other physical activities. A research study by the University of Brighton in East Sussex claims that, among healthy people aged 60 and over, the amount of energy used and the heart rate were on average 40% higher when Nordic walking compared to walking naturally1. Critically, there is now substantial enough evidence (via systematic review of research to date) of the beneficial effect that Nordic walking can have on the heart, blood pressure, physical exertion, breathing in oxygen and the quality of life in people living with various conditions that it can be recommended to a variety of people to improve their health and well-being2. A number of studies into Nordic walking and cancer have been done. A 2013 overview concluded that whilst it is viable to implement a Nordic walking programme in the health and social care setting during breast cancer treatment, further research is needed to discover how frequent and intense it should be depending on the severity of any lymphoedema3. Single research studies concluded, respectively, that: (a) Nordic walking alone – as well as combined with a series of other condition-specific exercises – as well as natural walking combined with the same exercises should be prescribed to prevent and treat arm lymphoedema amongst women surviving breast cancer4a and that it is feasible to introduce Nordic walking for this purpose during the treatment of women with breast cancer4b; that (b) Nordic walking led to improved posture in women undergoing breast cancer treatment whereas both water resistance and general fitness exercise did not5. An explorative study suggests that Nordic Walking is a feasible and potentially valuable tool when rehabilitating patients with breast cancer6. Regarding type 2 diabetes, single studies, respectively, found that: (a) Nordic walking can have a beneficial health effect on risk factors for the condition7; that (b) it can be introduced via primary health care as a low-cost means of exercise that promotes weight loss and health-related quality of life in people living with the condition8; and, that (c) it can lead to weight loss and a greater capacity for exercise amongst overwieght people with type 2 diabetes, but that supervised rather than unsupervised Nordic walking is more likely to provide sufficiently intense exercise for a significantly beneficial health effect on cardiovascular risk factors, especially in individuals with less good blood sugar control9, and can provide this in women with type 2 diabetes10. In relation to heart disease and stroke, single studies, respectively, reported that: (a) Nordic walking training appeared more efficient than natural walking for increasing the distance walked for patients with defined types of heart disease11; that (b) a Nordic walking programme is feasible in a Mediterranean public healthcare system and it can help reduce cardiovascular risk factors12; that (c) Nordic compared with ordinary treadmill training performed better at improving balance, gait and activities of daily living amongst stroke patients during rehabilitation13; that (d) Nordic walking was better than standard cardiac rehabilitation in improving the capacity to be physically active and other important outcomes in patients with heart failure14. Two single studies concluded, respectively, that, amongst individuals living with chronic obstructive airways dieases: (a) Nordic Walking is a feasible, simple and effective method of physical exercise and, in addition, has a proven positive impact on the daily activity pattern over the short and long term15; and, that (b) as is the case healthy individuals, that not only did Nordic walking better improve the uptake of oxygen than natural walking whilst perceived exertion remained unchanged, but that it also made no difference to effort to breathe16. A very limited study amongst older people with osteoarthritis in their lower extremities claims that, compared with natural walking, Nordic walking had a positive effect on the capacity to exercise and its intensity whilst having no ill effect on the perception of exertion or of pain17. An explorative study suggests there are several benefits of taking part in a group Nordic walking programme from the perspectives of its participants, who were living with various forms of arthritis, and that this may encourage more sustained participation18. Worth actually quoting its conclusions due to the clear evidence found, 2016 (systematic review of) research (to date) found that: “Nordic walking program[me]s with moderate and high intensities, with a minimum of 12 sessions of 60 minutes in a period from 6 to 24 weeks promoted positive effects on the severity [of the disease], gait, balance, quality of life, functional capacity and motor function in patients with PD.” It also highlighted the need for better research evidence of any longer term effect beneficial to health19. Subsequent single studies report that they respectively demonstrated that, in individuals living with PD: (a) Nordic walking on a treadmill accrues a therapeutic benefit to balance and ability to walk20; that (b) it can improve the dynamic stability of walking gait in PD, perhaps due to the upper body rhythmic movement involved in Nordic walking21; that (c) it has a similar beneficial effect as natural walking on major PD symptoms and on balance but a greater beneficial effect on the physical ability to walk22a and that, as part of a tailored exercise programme, it can improve daily activities as well as symptoms22b; and that (d) Nordic walking performed better when compared with both a fexibility and relaxation programme and with natural walking at improving posture, stride length and gait23. In a study of women with fibromyalgia, the researchers concluded that moderate-to-high intensity aerobic exercise achieved by Nordic walking was found to be feasible for such people. It resulted in an improved capacity to exercise aerobically alongisde a decrease in the degree to which physical activity was limited by the condition24. A single study reported that using Nordic walking poles may contribute to the rehabilitation of some individuals with lower back pain as it significantly increases abdominal muscle activity and it is these trunk muscles that stabilise the spine25. Nordic walking is walking more actively using both the upper and the lower body. This lengthens the spine and body weight is carried more efficiently. Postural muscles are activated correctly and exercised effectively. Stability of the spine and pelvis is improved. Core muscles are engaged – these stabilise the back. 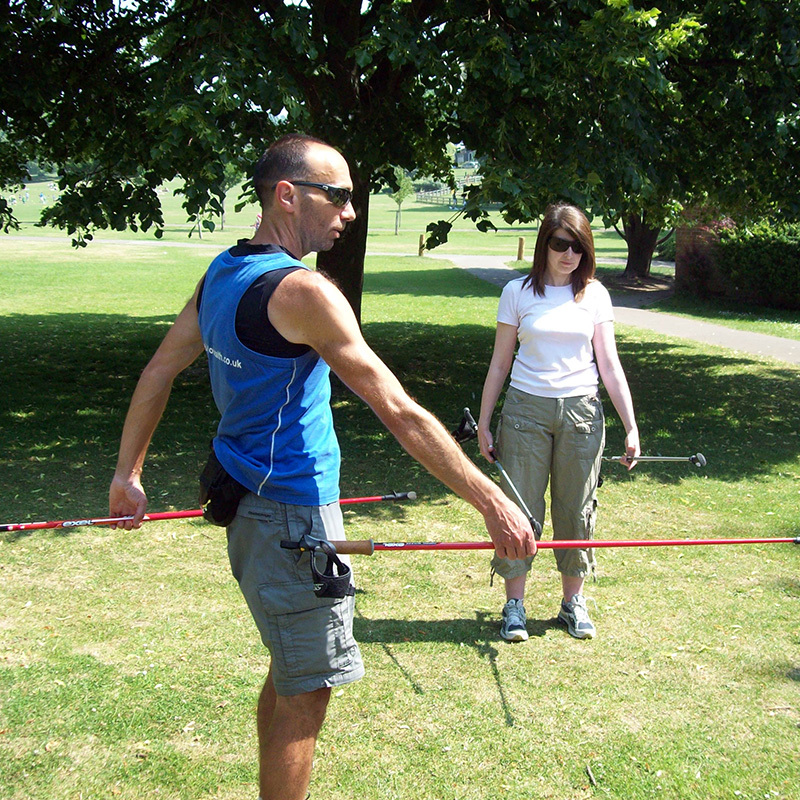 The upper body rotation employed in effective Nordic walking technique is vital for keeping the spine in good condition. Balance and co-ordination can also be improved through the added stability provided by the two poles. The aging process affects balance and co-ordination and one study of elderly, sedentary people claims that Nordic walking had a positive impact on their capacity to move26. Modern living means more of a sedentary lifestyle for most of us: sitting for long periods at home, at work or travelling. Combined with using computers, mobile devices and habitually carrying too much on one side of the body, back pain, neck and shoulder tension have become a very common, yet often invisible, health problem. With effective Nordic walking technique, rotation of the spine is enhanced compared to how most of us walk these days. This improves upper body mobility and strengthens spinal muscles, thus reducing the likelihood of neck, shoulder and upper back complaints27. Use of Nordic walking poles leads to a strengthening of the large back muscles that pull the shoulder blades down. This can significantly alleviate neck and shoulder tension. Ergonomically designed glove-straps (very different to the straps on trekking/natural walking poles) enable you to relax your hand as you push back into the glovestrap during the stride. This strengthens wrist muscles that can contribute to a lessening of RSI symptoms. The International Nordic Walking Association states that “…cardiac patients, people with overweight, diabetes, COPD (bronchitis etc.) and rheumatism have the perfect opportunity to improve their condition28…” and that other benefits of Nordic walking include aiding recovery from surgery for breast cancer and increase in bone density in relation to osteoporosis. In these situations, it is important to introduce Nordic walking at a suitable time in consultation with an appropriate healthcare professional, e.g. your doctor or physiotherapist. In walking with the specially designed poles, the joints are unburdened, leading to a release of tension in the neck and shoulder area and the spine is supported. Tschentscher et al 2013 American Journal of Preventive Medicine. (a) Di Blasio et al 2016 Journal of Physical Therapy Science; (b) Jonsson & Johansson 2013 Physiotherapy theory & practice. Hanuszkiewicz et al 2014 Journal of back & musculoskeletal rehabilitation. Fischer et al 2015 Journal of Psychosocial Oncology. Fritz et al 2011 Diabetic Medicine. Fritz et al 2013 Diabetes/Metabolism Research & Reviews. Sentinelli et al 2014 Science & Sports. Girold et al 2017 Annals of Physical & Rehabilitation Medicine. Kang et al 2016 Journal of Stroke & Cerebrovascular Diseases. Keast et al 2013 Canadian Journal of Cardiology. Jones 2011 Arthritis Research & Therapy. Breyer at al 2010 Respiratory Research. Barberan-Garcia et al 2015 Respiration. Parkatti et al Universtiy of Jyvaskyla, Finland 2002. O'Donovan & Kennedy 2014 Disability & Rehabilitation. Silva et al 2016 Fisioterapia e Pesquisa. Bang et al 2016 Aging Clinical & Experimental Research. Warlop et al 2016 European Journal of Physical & Rehabilitation Medicine. (a) Monteiro et al 2016 Scandinavian Journal of Medicine & Science in Sports; (b) Cugusi et al 2015 Neurorehabilitation. Reuter et al 2011 Journal of Aging Research. Antilla et al Helsinki IV College 1999; Karvonen et al Mikkeli Polytechnic School 2001. Sparkes et al (2012) Journal of Bone & Joint Surgery. INWA (2005): Instructor Manual - 3rd Edition International Nordic Walking Association. Wasenius Universtiy of Helsinki, Finland 2014.
International Nordic Walking Association 2011. Other benefits of Nordic walking include contributing to rehabilitation from surgery for breast cancer and to improving bone density in relation osteoporosis.